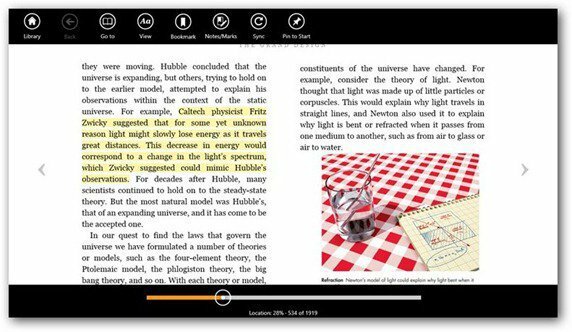 Amazon has made its first step into the Windows 8 atmosphere with its new Windows Kindle App, now available in the Windows 8 app store. In the tide of the Windows 8 official launch, Amazon has announced a Kindle app for Microsoft’s latest operating system. There’s a few things worth mentioning here (aside from the features of the app). First off, the app is already available in the Windows Store here. Secondly it’s free, but we were expecting that. Our initial impression of the Kindle app for Windows 8 is that it’s rather nice. It has Amazon’s typical design, just integrated with Windows 8’s style and interface. There really isn’t a whole lot to it. 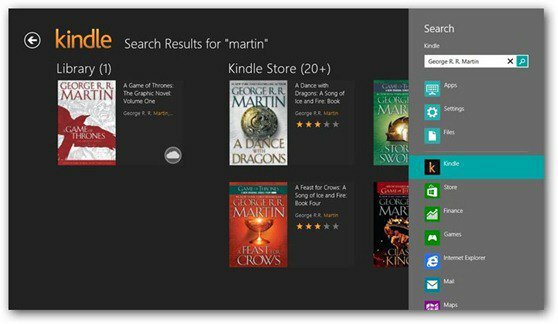 It allows you to read your favorite books on your computer or tablet with a click (or tap) on the cover of the book you want to read and you can pin books to your start screen, too. It has cloud features, so it will sync the books you have already bought (including the place you got to in those books, through Amazon’s Whispersync technology). And, of course, you can highlight passages and put in your own notes. As you would expect, it also connects directly to Amazon’s Kindle store so you can purchase books directly through the app. A great addition to Windows 8, indeed. Will you install it?